May 24, 2013 / P.J. After spending most of his life working in marketing and advertising, which included producing commercials and an ill-fated anti-hangover beverage, Aaron Martin said he realized he needed to branch out on his own. As a longtime member of the Omaha, Nebraska disc golf scene and a former player for Team Discraft, Martin has watched the sport grow to its current level, bringing both new players and business opportunities to the table. But he has also witnessed firsthand the wear and tear associated with the sport’s boom. That solution has manifested in the form of TeeBoxx, the automated disc golf retail center and accompanying business Martin and his partners have pioneered. The story of TeeBoxx is nearly five years in the making. Recognizing that most of the money coming through disc golf was associated with retail, Martin – who now serves as the company’s chief marketing officer – and his partners decided that an automated machine was the best way to offer something new. “Disc golf has been something that I’ve really wanted to be a part of and somehow figure out a sustainable business through it,” he said. 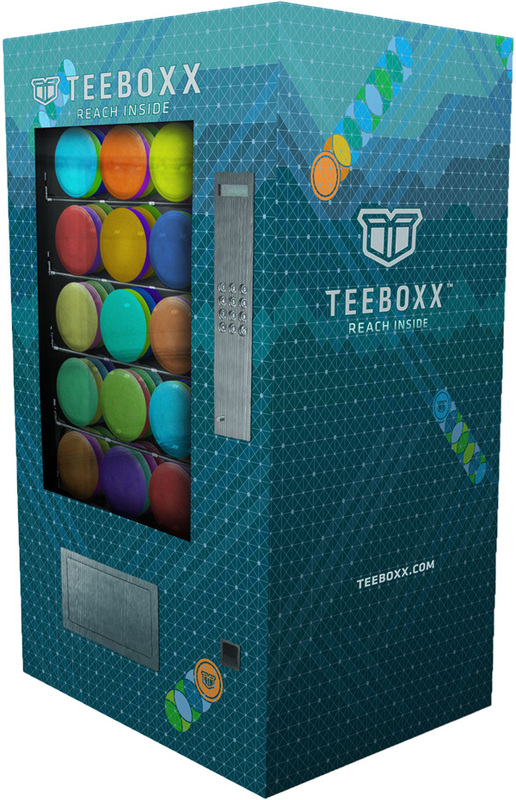 At its most basic level, TeeBoxx is a vending machine much like those that dispense candy and other snacks. With the familiar spinning coils holding discs in place and a keypad used to make a selection, the mechanism is one most people should be familiar with. On the superficial level, though, is where TeeBoxx’s similarity to other vending machines ends. 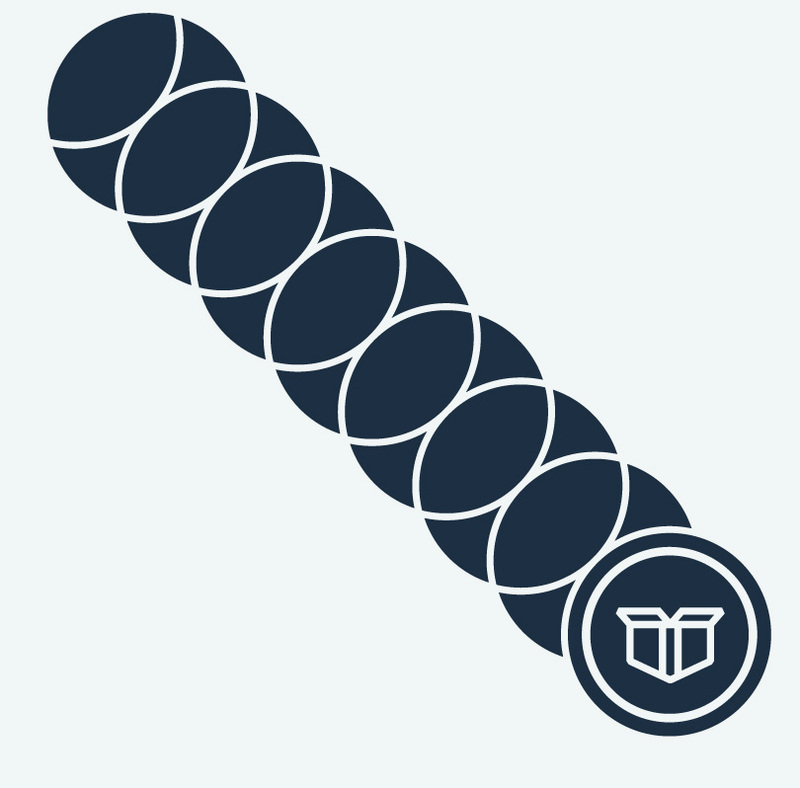 From software and security to the company’s cultivation of community partnerships and course revitalization efforts, the product strives to be more than just a disc dispenser. 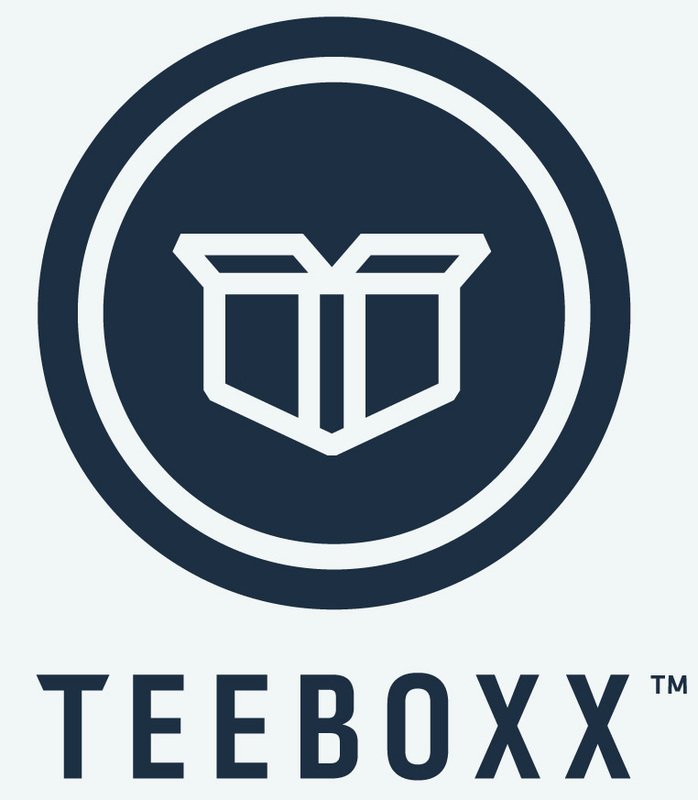 But before the first TeeBoxx could get in the ground, disc golf and technology had to evolve to the point of making an automated retail venture possible. But creating a vending machine for discs, Martin said, was not as simple as it would appear. In fact, the task of marrying disc dispensing, durability, and weather-resistance required an engineering team to be hired, as snack-style units were not up to the task. A markup of the TeeBoxx machine. Those solutions include a quarter-inch polycarbonate surface over the disc viewing area, as well as an armor shell that encloses the machine. Pillars are also cemented into the ground surrounding the TeeBoxx so a would-be thief can’t simply attach a chain to the machine and drive away. But in addition to the physical strength of the unit, TeeBoxx was also created with numerous technological safeguards, such as an alarm and an automated network that will send an alert if someone is shaking the machine. Martin said all of this was done in an effort to put TeeBoxx’s security on par with that of a safe. And even if that were to happen, the thief would only be walking away with stacks of discs, as TeeBoxx uses a credit-card only format to make sure cash doesn’t serve as a temptation. There is a lot more that has gone into TeeBoxx than just making it secure, though. Vast amounts of market analysis and research have been used to yield Martin and his partners a “Top 100” list of parks and courses they will target as TeeBoxx locations. From there, the company will pitch its profit-sharing model to government decision makers and local disc golf club officers in the hopes that they can put a unit behind Hole No. 1 of the desired course. “If you’re in that Top 100, we call the park and we say, ‘Hey, we’re going to pay for this machine to go into your park and we’re going to give you a percentage of the profits,’” Martin said. Deeming the amount of sharing an “appropriate split” to sustain the business while also making it appealing to communities, Martin said the intention is for city officials to use their portion of the profits as a “revitalization fund” to funnel resources back into the park where the machine is located. “The whole idea is that, when the TeeBoxx goes in there and the sales are there, hopefully it’ll revitalize the course,” Martin said. With the target list in mind, it is up to people like Ross Brandt, TeeBoxx’s community development director, to do the heavy lifting by pitching the concept to decision makers at the local government level. And while nobody at TeeBoxx can tell a city what it can or cannot do with the money a partnership would generate, Brandt strikes a balance by pointing out that putting the profits back into the disc golf courses will keep the revenue flowing. Brandt, who boasts a master’s degree in urban and regional planning, also calls on his experience in the field to speak a common language with officials that makes them more comfortable and willing to listen. The same concept applied to Martin’s approach to the local disc golf club in Miami, home of the first TeeBoxx. The first — and currently only — TeeBoxx resides at Kendall Indian Hammocks Park in Miami. Installed earlier this year, the ‘Boxx thus far has been a success, according to TeeBoxx sales director and Miami Disc Golf Association president George Alvarez. Located at the main office of the park in between four softball fields, Alvarez said he has witnessed both novice and veteran players testing out the machine. The proximity to other sports has also been an advantage for sales and has created awareness of disc golf. 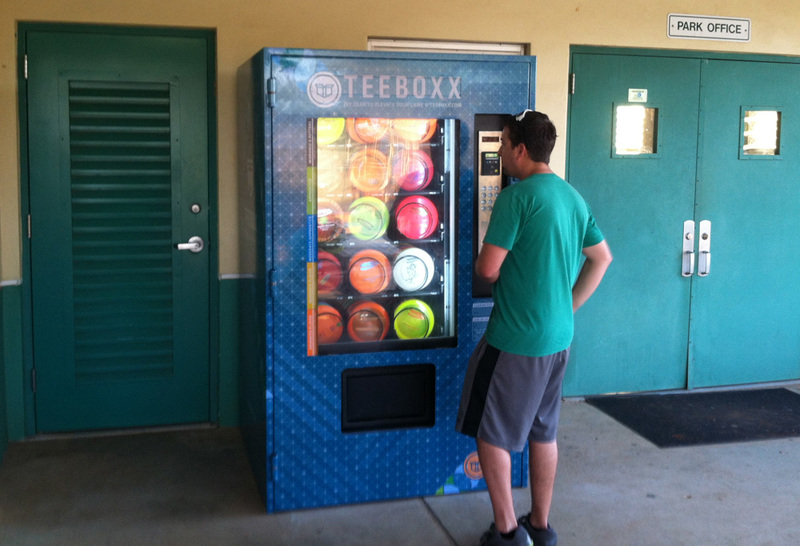 Jason Castron, a member of of the Miami Disc Golf Association, checks out the Teeboxx first — and currently only — machine at Kendall Indian Hammocks Park in Miami. In fact, aside from one club turning the company down, Martin said the reception to TeeBoxx so far has been overwhelmingly positive. And even when there is concern from local businesses about competition, Martin said the company’s target market is not going to take away from others. That information is displayed on the side of the TeeBoxx under categories that correlate to experience level, as Martin said he doesn’t want the product to be complicated for new players. All of the discs are top sellers, range in price from $9.99 to $18.99, and weigh between 170-180 grams. Then, Alvarez said, once new players have been hooked on the sport by their TeeBoxx purchase, they can go to other existing retailers to refine their selections. While TeeBoxx has only produced one machine so far, the company plans to roll out at least 30 this year, with the next units to start appearing within six weeks in mostly southern states. With its presence set to expand, Martin said he is hoping that TeeBoxx can help to bring more money to disc golf courses and keep parks in shape for the future. “If all the money coming through disc golf is at the gas station across the street and the park is becoming eroded and there is trash all over the ground, the signs need to be updated — that just doesn’t make sense to me,” he said. And while TeeBoxx is a business venture, Martin said that, if it is successful, even more will come back to the local disc golf scene. All of this is an effort to make TeeBoxx another vehicle through which disc golf can prosper. I am very particular about the weight of my discs. Would I be able to select particular disc weights, and not a weight range? When I think like an entrepreneur, and envision myself running a little pro shop, I see myself preferring to do business in cash. When you do business by credit card, the bank gets a piece of every sale, and when the people I know head out for league play on weekends, they bring cash. So, you sell one machine, and that’s in town where your sales maanger resides, and you cal it a business? Withl all the security and extra armor bumping costs, plus giving a cut of the profits to the entity that allows the vending, it’s hard to imagine that this company will ever show a profit. Having real pro shops on courses will foster the growth of the game. I suspect that Teeboxx is an idea whose time may never come. But as disc golf grows, look for an increasing number of products to hit the market. Some might work, but this one is is almost as dubious as the beeper that screws into the disc.